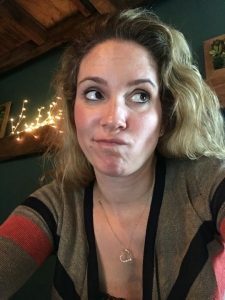 Well it’s been a few months since my last blog, but spending days at the beach getting a tan, letting the sun highlight my hair, feeling the sand between my toes, taking a dip in the refreshing waves, while sipping on some iced tea, and taking a nap has a way of making the summer get away from you….. 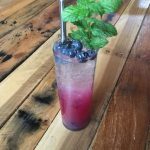 Being white as a ghost in the summer time is worth it though when good things are happening and hard work pays off at the distillery and really, it’s a lot of work to mosey to the beach anyway!……..Right? Yea, I’m going to go with that..
Wiggly Bridge Distillery has been full of new and exciting things and summer brings out tourists that we get to share our passion with in abundance! Probably on the top of MY list is that we are going to be releasing our AGAVE soon! It is a tequila, but it cannot be called that since it is not made in Mexico! So Agave it is! We will be producing 4 types of agave: Platinum, Reposado, Anejo, and a Super Anejo. Our bottles are really freaking cool and the label is even better. I don’t want to ruin the surprise for our release but here is a sneak peak! Tequila (agave) is one of my personal favorite spirits. 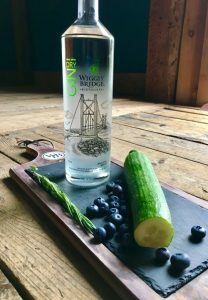 Prior to the birth of Wiggly Bridge Distillery it was probably the only spirit I could drink straight and enjoy it. I’d put a little salt on my hand, knock back some tequila and bite into a lime wedge. Ok, maybe those were my college days…. Good news is I didn’t do it enough to be repulsed by tequila and I enjoy, honestly, just sipping on this delightful spirit. It makes a KILLER margarita and I cannot wait to share it with you! What makes our agave so special, among many things, is that we use 100% Blue Agave. No sugar added unlike many other tequilas/agaves. More information on the release as we get closer! The other wonderful news of this summer is we are now allowed to participate in farmers markets with tastings and selling product! Look out farmer’s markets here we come!!!! I’ll keep you posted on which farmer’s markets and when we will be participating. 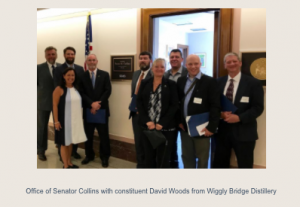 Another really cool thing is that the big guy (Dave) made his way to Washington D.C to help gather support for the reduction of federal excise tax for small distilleries! Did you know that we have to pay $13.50 per proof gallon JUST IN EXCISE TAX! 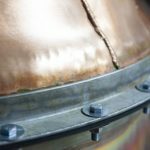 That adds up to a significant amount especially for craft distilleries like ours. Hoping this goes through! Check out dave below, he is on the left. I apologize for the quality picture, I had to resort to taking a screenshot of someone else’s picture as my request of even one picture was not fulfilled…. (ah hem DAVE). 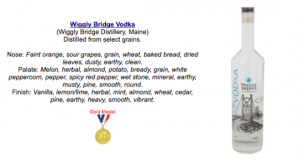 I’m going to leave off here with yet ANOTHER medal earned by Wiggly Bridge Distillery. This time it is for our vodka. Check it out, another GOLD medal!